JULY 24, 2018: I will be a panelist for the Albemarle Charlottesville Historical Society's inaugural Summer Conversation. The discussion will focus on the black neighborhood Vinegar Hill, its destruction through Urban Renewal in the mid-1960s, and the creation of the Downtown Mall the decade after that. Panelists will include the architectural historian Sarita Herman, former mayor Charles Barbour, the architect Michael Wheelright, city councilors Kathy Galvin and Wes Bellamy, businessperson Yolunda Armstrong Harrell, and affordable housing advocate Shelley Murphy. Find us at Vinegar Hill Theater from 7 to 8:30 p.m. Video below. JUNE 21–24, 2018: I'll be a featured speaker at the Summer Jefferson Symposium: Thomas Jefferson's Last Legacies at the University of Virginia. JUNE 1, 2018: On the occasion of Reunions Weekend here in Charlottesville, I'll be giving a talk with Molly Schwartzburg, a curator at the University of Virginia's Special Collections, titled "Object-ifying UVA: The University's Bicentennial through the Lens of Current Events." You can find us at Minor Hall, 1 p.m.
APRIL 16, 2018: I'll be delivering a keynote address at the annual Founder's Day program organized by the University of Virginia's Advancement Community of Learning. APRIL 17, 2018: I'll be talking to the Newcomer's Club of Charlottesville on the history of the University of Virginia. March 22, 2018: I'll be moderating a panel at the Virginia Festival of the Book, hosting two amazing writers: Dalia Rosenfeld and Tom Sleigh. Find us at CitySpace in Charlottesville at 10 a.m.
March 16, 2018: I'll be moderating a panel at Virginia Forum, an annual conference on Virginia history hosted this year at Emory & Henry College in Abingdon. R. Neil Hening, Kathy O. McGill, and Susan Hellman will talk about "Literary Landmarks on Virginia's Historical Landscape" from 3:30 to 5:00 in McGlothlin-Street Hall, Room 302. DECEMBER 13, 2017: I'll be talking about Bix again for Books & Brews, this time at Kardinal Hall in Charlottesville, Virginia, 7–8 p.m.
DECEMBER 12, 2017: I'll be talking about Bix at Books & Brews, a monthly collaboration between Pale Fire Brewing Company in Harrisonburg, Virginia, and WMRA radio. The event, at Pale Fire, will be 7–8 p.m.
DECEMBER 5, 2017: I'll be a featured lecturer for the annual "One-Day UVA" event sponsored by Lifetime Learning at the University of Virginia. The theme this year is the University of Virginia in 100 Objects. Go to the site to register. OCTOBER 17, 2017: I'll be speaking at the launch of Mr. Jefferson's Telescope and an exhibit, "Object Lessons," based on the book at the Albert and Shirley Small Special Collections Library at the University of Virginia, 5:00–7:30 p.m.
OCTOBER 19, 2017: I'll be presenting with Peter Hedlund and Elgin Cleckley on a panel titled "Contextualizing UVA's Landscape of Slavery" at the University's Slavery, Public Memory, & the Built Landscape symposium, hosted by the President's Commission on Slavery and the University at the University of Virginia. You can find us in Newcomb Hall at 2:30. OCTOBER 6, 2017: As part of the University of Virginia's bicentennial kickoff event, I'll be talking about the school's history at 4 p.m. in the auditorium of the Albert and Shirley Small Special Collections Library. The library will be hosting an exhibit I co-curated in conjunction with Mr. Jefferson's Telescope. UPDATE: Here it is, a talk about not being a Virginian, about writing about the University of Virginia's history, about the ways in which we can create narratives out of objects, about my daughter's frozen pizza eating. Enjoy! SEPTEMBER 18, 2017: I'll be reading at Prairie Lights in Iowa City at 7 p.m., as part of the Nonfiction Writing Program's Visiting Writers Series. I'm excited because a) this is my two-time alma mater and b) this is Prairie Lights, one of the great bookstores in America. This is a dream come true. AUGUST 17, 2017: Come hear about Bix as part of the Third Thursday speaker series at the Lodge at Old Trail in Crozet, Virginia. The talk is at 5:30 p.m. and free and open to the public. RSVP to rsvp@lodgeatoldtrail.com. AUGUST 8, 2017: Pub day: MR. JEFFERSON'S TELESCOPE: A HISTORY OF THE UNIVERSITY OF VIRGINIA IN 100 OBJECTS will be published by the University of Virginia Press. AUGUST 5, 2017: I'll be reading and signing books at Barnes & Noble in North Park Mall, in Davenport, Iowa, at 1 p.m.
UPDATE: Below, the view from Paula Sands Live, as well as the eighty-eight-year-old Don Wooten in his studio and the books at Barnes and Noble. AUGUST 5, 2017: I'll be Don Wooten's guest on Saturday Morning Live from 10 to 11 a.m. on WVIK Radio, Rock Island, Illinois. AUGUST 3, 2017: I'll be doing a short reading at the Davenport Public Library at 1 p.m.
UPDATE: The events at the Davenport and Bettendorf libraries were well attended thanks to the promoters, the University of Iowa Press, and Joe Taylor, president and CEO of the Quad Cities Visitors and Convention Bureau. And Charity Nebbe of Iowa Public Radio—she really knows her stuff! Below are a couple pics from inside the IPR studio as well as signage for the Davenport Public Library's annual Bix Porch Party. AUGUST 2, 2017: I'll be appearing at the Bettendorf Public Library, in Bettendorf, Iowa, at 7 p.m.
JULY 26, 2017: I'll be appearing as part of a James River Writers program titled "The Art of the Start: Finding an Entry-point to Your Story." 6–8 p.m., Firehouse Theatre 1609 West Broad Street, Richmond, Virginia. UPDATE: I don't mind saying I was really nervous before this event. It's such a cool setting but so many people came and the lights were so bright! But it ended up being really fun, and I was thrilled to meet my co-panelists Clifford Garstang, Shahan Mufti, and Louise Ricks, plus the wonderful moderator Kris Spisak. Here's a view from the stage—and yes, that's the top of my beer bottle there. Anyway, thank you, James River Writers. JULY 22, 2017: I'll be reading at New Dominion Bookshop, in Charlottesville, Virginia, at 6 p.m. After the untimely death of its owner, the business is under new management. 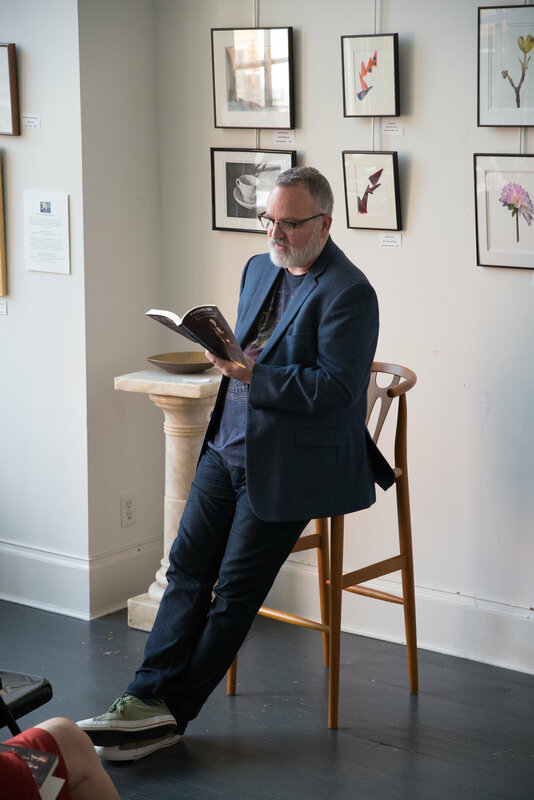 All cities, including Charlottesville, profit from a good, independent bookstore, so come out not only to support me but to support New Dominion. UPDATE: Thanks to New Dominion for hosting, to everyone who came, and to Peter Hedlund for the great photos. I'm only realizing now what a wonderful view the store has. Check out those mountains! JUNE 29, 2017: WriterHouse in Charlottesville, Virginia, will be hosting a Literary Salon to discuss my book. Come by at 5:30 p.m. The moderator will be Jay Varner, a wonderful writer and teacher. Crackers, cheese, and wine will be part of the deal, too, so come on by! JUNE 15, 2017: I'll be reading at the Bangor Public Library in Bangor, Maine, at 6 p.m.
JUNE 14, 2017: I'll be reading at Print: A Bookstore, 273 Congress St., Portland, Maine, at 7 p.m.
UPDATE: This was one of the most fun readings I've done yet, with a great question-and-answer session, the highlight of which was Bix Beiderbecke's grand-niece introducing herself. What an unexpected and lovely surprise! 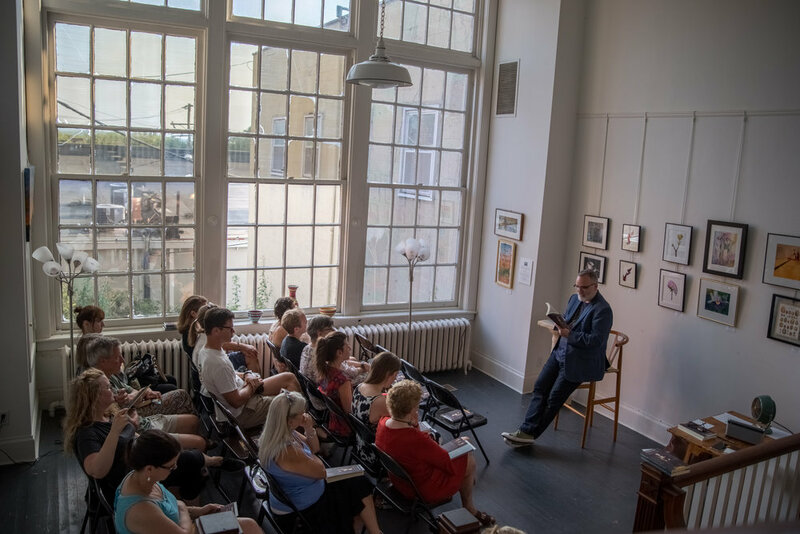 My friend Rebecca Goldfine took this photo of my reading at Print, in Portland, Maine. And yes, that is the same shirt-jacket combo as my reading in Charlottesville. MAY 27, 2017: I'll be reading at Chop Suey Books, 2913 West Cary Street, in Richmond, Virginia, at 7 p.m. This store, this neighborhood, this whole city is so hip. I hope you'll come out! MAY 18, 2017: I'll be giving a talk on Bix Beiderbecke and Finding Bix at the American Jazz Museum in Kansas City from 6:30 to 7:30 p.m.
UPDATE: Loved Kansas City! Thanks to Bill McKemy and the American Jazz Museum for hosting me. MARCH 25, 2017: I'll be signing books in the lobby of the Omni Charlottesville Hotel from 9:30 to 10:00 a.m. as part of the Virginia Festival of the Book. Come say hi! MARCH 23, 2017: I'll be appearing at the Virginia Festival of the Book in Charlottesville, Virginia, on a panel with Paul Devlin, editor of the recently released Murray Talks Music: Albert Murray on Jazz and Blues. This is the largest book festival in Virginia, and you should check it out if you'll be in the area. There's something for every kind of reader. UPDATE: Fantastic event today. Thank you to the Virginia Festival of the Book, Paul Devlin, and moderator Stephanie Doktor. Consider supporting the festival. It's a huge and wonderful community event produced with very limited resources. JANUARY 15, 2017: I will be attending the MLK Sunday Supper, from 3:30 to 5 p.m., at 2 Witches Winery & Brewing Company, in Danville, Virginia. The event is jointly hosted by Danville by Choice and History United, and I'll be talking about the Danville Riot of 1883. Thank you, Ina Dixon, for the invitation! UPDATE: Thanks to History United and Danville by Choice for the invite. The discussion we had post-talk was amazing, bringing in lots of different voices on what Danville's history means to us today and how we can use it to make our communities better places to live. Thank you! UPDATE: The Newcomers Club puts on a great event at Wintergreen. Food was delicious and the questions and discussion about the role of a relatively unknown Virginia Indian named Paquiquineo was really gratifying. Thank you for bringing me into the fold for the afternoon! APRIL 17, 2016: Molly Minturn, Claire Millikin, Mark Raymond and I will be appearing as part of the Inside the Writer's Studio series at WriterHouse in Charlottesville, 11 a.m. There will be literary talk focused on what happens when writers are married to one another (or coparenting, or whatever). Come, there will be champagne. UPDATE: Thanks to Jennifer Niesslein for the invitation. It was wonderful to meet Claire and Mark, whose writing everyone should check out. JUNE 13, 2014: I will be reading at New Dominion Bookshop in Charlottesville at 5:30 p.m. to mark the publication of MAN IN THE MOON, a collection of essays on fathers and fatherhood. It includes my essay, "Stories from the Lost Nation." UPDATE: What a great crowd! And thank you to Molly for the lovely introduction and to Carol and Mitzi for giving me the space to read.